It was 50 Years ago today, (give or take), that Sgt. Pepper’s taught the band to play. Sgt. 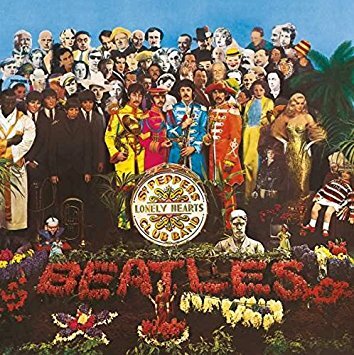 Pepper’s Lonely Hearts Club Band has reached the half-century mark and the Capital label has released a massive 4-CD + DVD + Blu-ray set that contains everything you could ever want to hear or know about one of the most influential albums in music history. “Yesterday” was one of the most recorded songs of the 20th century. It was also a Paul McCartney solo effort released under the Beatles name. In the studio producer George Martin suggested the McCartney record the song with just an acoustic guitar backed by a string quartet. It may not have been typical rock and roll but it became one of the most recognizable songs in music history. “Yesterday” reached the top of the American Singles Chart on October 9, 1965, and there is remained for four weeks. The Beatles returned to the top of the American Charts for the ninth time on September 4, 1965, for the first of three weeks. “Help” was the title song of their second film and had a quick journey to the top. It entered the charts at number 41 on August 7, and four weeks later it arrived at number one. John Lennon once stated that “Help” and “Strawberry Fields” were his favorite songs. “Ticket To Ride” may not have spent as many weeks at number one as the Beatles biggest hits but on May 22, 1965, it spent the first of seven days on top of the American Pop Chart. Interestingly if you look at the fine print on the label of “Ticket To Ride,” you will see it as a release from the upcoming Beatles film, Eight Arms To Hold You. The name was ultimately changed to Help. “I Feel Fine” was the song that sold me on the Beatles. The guitar feedback at the beginning was groundbreaking in 1964. When you add in the flip side “She’s A Woman,” which reached number four on the Billboard Hot 100, you have a spectacular single. When “I Feel Fine” reached number one on December 26, 1964, it was their sixth chart topper. It spent three weeks in the number one position. The two sided hit single provided their 29th and 30th chart songs of the year. “I Feel Fine” provided a fitting end to 1964 for the Beatles as no artist in the history of American music had enjoyed such a successful year, but the best was yet to come. You are currently browsing the archives for the Beatles Reviews category.